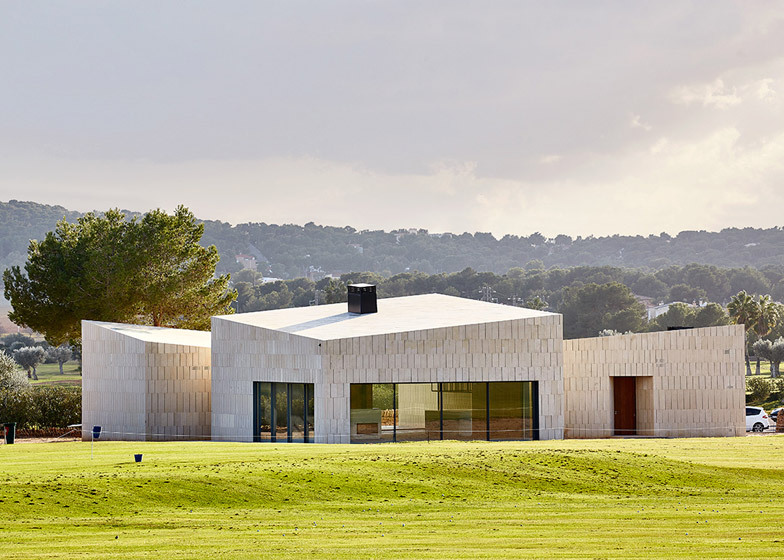 Golf clubhouse designed by GRAS to resemble "a rock"
The walls and roofs of this golf clubhouse in Mallorca are clad in local stone to give the building a homogenous appearance that emphasises its angular monolithic form (+ slideshow). 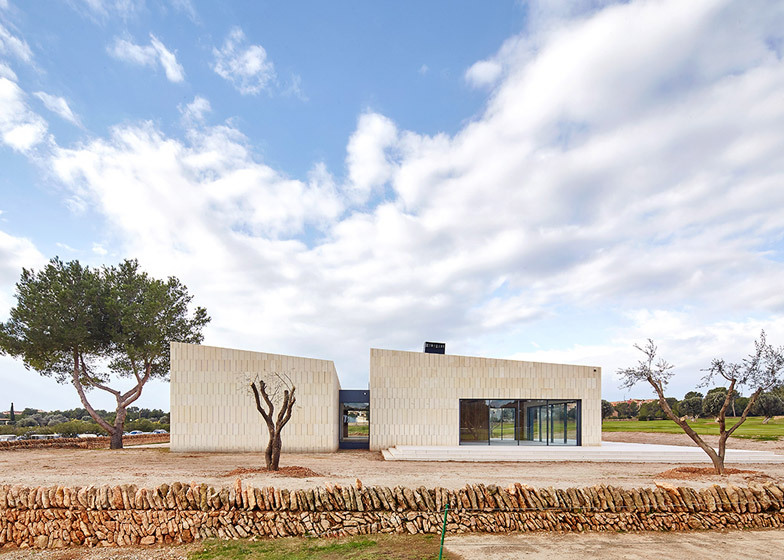 Designed by local studio GRAS, the clubhouse is located at the Golf Santa Ponsa club on the west side of the Spanish island. It provides facilities for players using some of the courses, which had previously been accommodated in temporary tents. It accommodates changing rooms, an office, storage, a lounge, a bar, and a restaurant and accompanying kitchen. 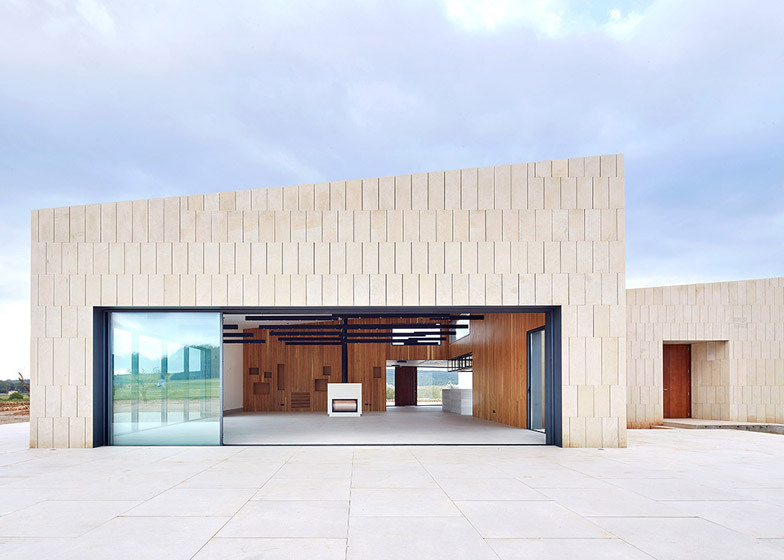 "A clubhouse is not just a sports facility with a clear programme of practicing the sport," architect Guillermo Reynes told Dezeen. "It also has a very important social aspect as a meeting point for its members and has be in contact with the nature." 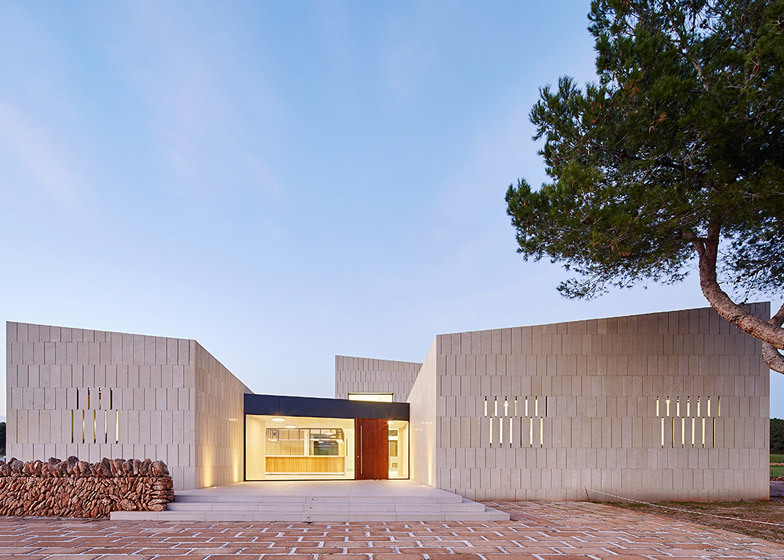 Four distinct volumes surround an enclosed central courtyard, with facades that are either opaque or transparent depending on their function. 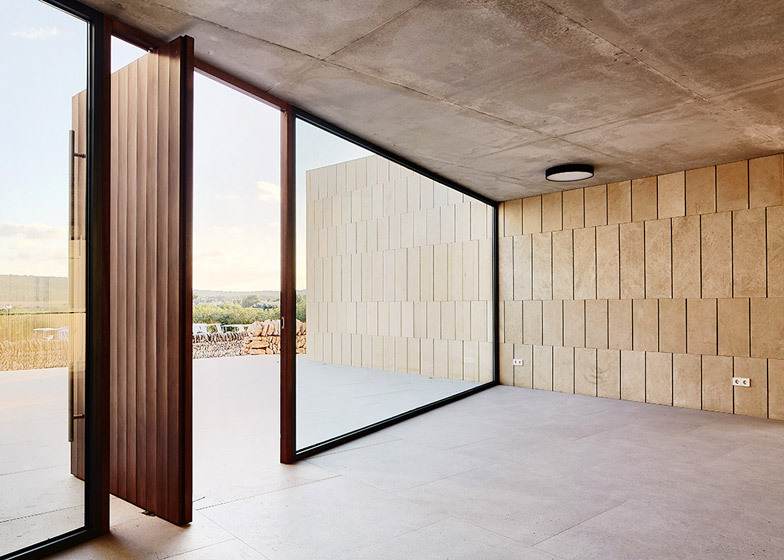 Seemingly windowless walls surround the kitchen and changing rooms, while the walls of the restaurant feature glazed sliding doors that open onto a large terrace. The gaps between the four blocks are filled in with glass to enable views from the courtyard towards the golf course. A planning requirement originally demanded sloping roofs based on the local vernacular. The architects offered an alternative interpretation, creating irregular angled forms that give the building a contemporary character. 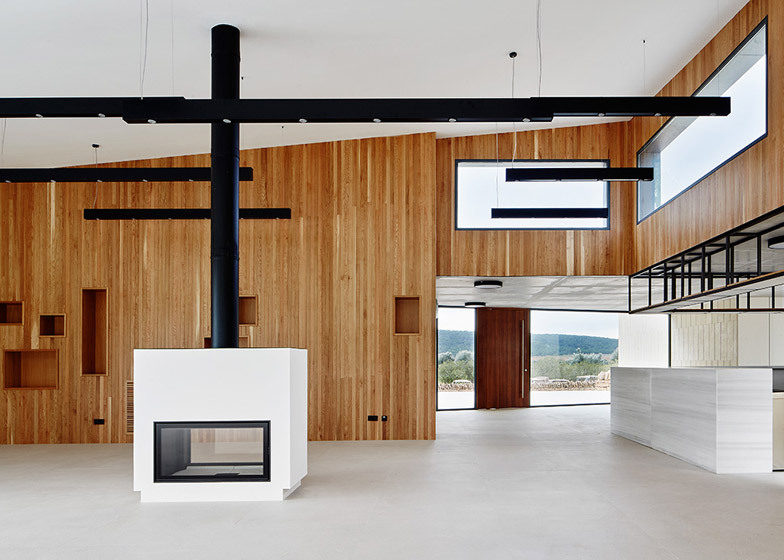 "[The regulations] gave us the opportunity to explore different arrangements of the volumes and design the building in a way that it looked completely different from every angle," explained Reynes. "Sometimes it looks small, or massive, or seems to extend into the landscape. It gives a very rich experience while playing the course as the building looks very different depending on the player's position." 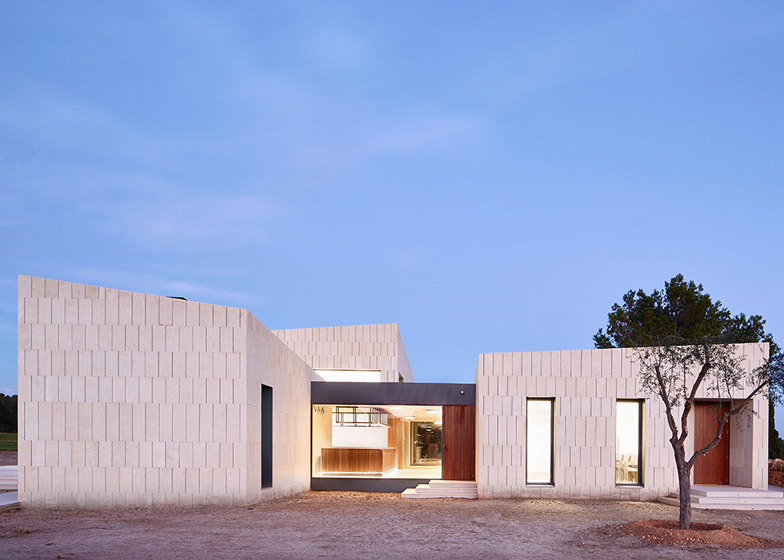 An emphasis on the varying shapes of the four volumes is enhanced by the uniform use of local Santanyi stone for the facades and roofs, which are visible from different parts of the course because of their angled surfaces. "We wanted to create something iconic in the landscape using a traditional material," said Reynes. "We decided to create a rock in the middle of the golf course that has a lot of visibility from many angles and distances." 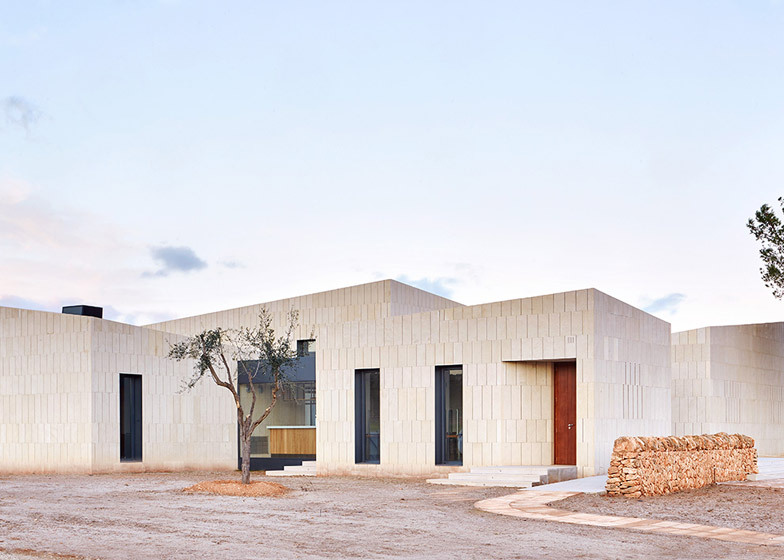 Reynes chose the stone based on his admiration for the way it was applied by the famous Danish architect Jørn Utzon in a property he built for himself on the island in 1971. Some of the stone walls extend from the exterior into the rooms to create a sense of continuity between indoors and outdoors. 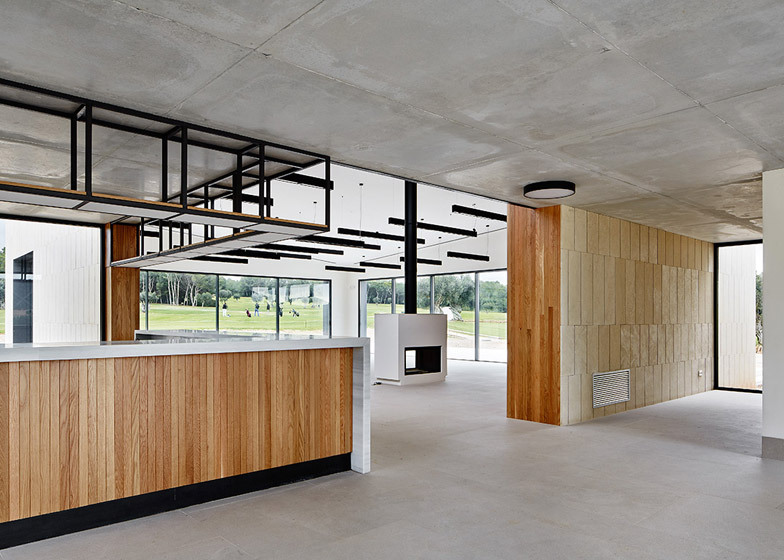 Other walls are clad in oak to give these spaces a warm and homely feeling intended to encourage relaxation and social interaction between members.